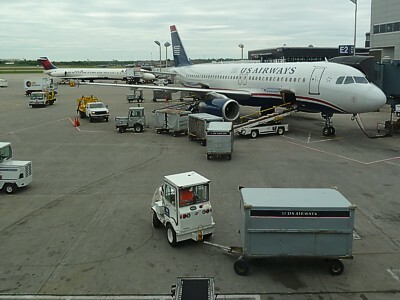 US Airways operates a fairly modern fleet of 347 aircraft, all of which are twinjets, and almost all of which are short-haul, due to the domestic-centric nature of US Airways operations. Indeed, out of that 347, only 16 are true twin isle longhaul A330 aircraft, although there are 15 more ancient 757s which do some longhaul work. A sore disappoint for many passengers is that US airways entertainment on flight is very basic compared with most other airlines, with no seatback TV, except longhaul, where it is a very down market system. Read more about US Airways's inflight entertainment and seatback TV. There is a still a strange combination of Airbus aircraft from US Airways, and Boeing from America West. You can tell what you will be on: flights operated using former America West aircraft are numbered 1-699, whereas flights operated by pre-merger US Airways aircraft and crews are numbered 700-1999. News: US Airways is raising the price for exit seats on transatlantic routes from $25 to $35. Just when many airlines were moving into three and four class operation, US Airways scrapped First Class, and became a two class airline. However, for marketing reasons, they still kept the name First on domestic flights. This leads to endless confusion, with what is marketed as First actually being a down rated business class. 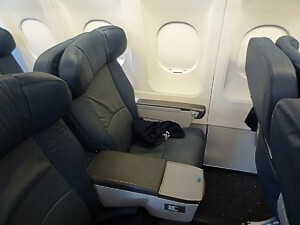 US Airways seats in Business Class are neatly sub-divided into two types of seats on the tiny fleet of nine A330 aircraft that US Airways use long haul. Both seats are firmly old second generation seats, where you can either travel in an old 'cradle' seat (old business class) or a flat bed (old first class). Food, drink and service is identical in both. The A330 Envoy Sleeper Seats are the old First Class, and the seat is pretty old, having been around for over a decade, but when first sold it was a true First Class seat, but at least that means it has dated pretty well. It goes horizontal, forming a flat bed (94 inches long), with a small AVOD TV screen, and EmPower power socket. For the newer true A330 business class seats, US Airways has taken the classic Cathay Pacific style seat which is now licensed as the Cirrus model designed by Sicma Aeroseat and features a fully flat semi-private "pod", in a 1-2-1 reverse herringbone configuration. At least every seat has access to the aisle, and there is a decent AVOD TV Screen, plus an EmPower power outlet. The seat has thankfully been retrofitted to all aircraft. This seat has also been retrofitted to the 757, with a 2-2 layout, but it is a lesser version, giving 160 degrees and 55" of pitch. Finally, you may get old Envoy Class, was an old cradle seat, which has now been removed from all A330 aircraft, but which is still present on the Boeing 767-200ER, with 18 Envoy seats in a 2-2-2 configuration. They only recline to lie at a slope to the floor. There is a 110 V AC power socket, but no seatback entertainment: instead you get a AVOD device handed to you after takeoff. Economy Class on US Airways is pretty basic stuff. On the Airbus A330 there is a 30 inch pitch, in leather, with winged headrests, and a 2 inch recline. At least a few aircraft are starting to have seatback TVs fitted: mind you, you still have to shell out $5 for headphones (they are classic overhead band twin prong types). On Boeing 757 entertainment is overhead. Do not take delight in the words First Class. The experience on board US Airways in First really isn't great. At least the seats are bigger, with a proper business class seat fitted, having a 38 inch pitch and a width of 21 inches, in 2 rows of 2+2. There are blankets and pillows, and free wine, beer and spirits, however you'll starve unless the flight is over 3.5 hours long. There is no in seat power, and no entertainment. At least you are allowed one free checked bag. The reason why it's so poor compared to other international airlines is that few people ever pay to sit up front. Most of the cabin is filled with Dividend Miles members on free upgrades. In Economy, or what US Airways calls coach, you get a pretty basic seat with a pitch of 30 inches, and that's it. There is no in-seat power, no entertainment, and no free food or drinks. There is also no free checked bag allowance, so you'll need to pay US$25 at the airport or more for that. Read more about US Airways baggage allowance. US Airways has a grand total of 9 longhaul Airbus A330-300 aircraft, however despite this low number, they are definitely the aircraft you want to be on transatlantic, by reason of the fact that they no only have a twin aisle, but also in economy there are twin seats at the windows, which makes getting out of a seat much more comfortable. There are 6 seats in old First Class, now sold at 'Envoy Sleeper Seats', which are the decade old flatbeds. Indeed, when first sold it was the longest flatbed in the market. It goes horizontal, forming a flat bed (94 inches long), with a small AVOD TV screen, and EmPower power socket. On the A330-300 there are 24 seats in Business Class, sold as 'Envoy Class'. These are classic older style business class seats, but there is a decent AVOD TV Screen, plus an EmPower power outlet. However, for a better seat with more privacy, you'd be better off in the newer 200 model A330 aircraft. Down the back are 263 economy seats. US Airways is starting to retrofit them with seatback TV screen. US Airways has 7 longhaul Airbus A330-200 aircraft, which are slightly smaller versions of the 300 model, and which don't feature the old first class cabin. In Business Class there are 20 Cirrus flatbed seats, in a 1-2-1 reverse herringbone configuration, with an AVOD TV Screen, plus an EmPower power outlet. These seats are very good, and are vastly better than the eats in the A330-300. The Cirrus model designed by Sicma Aeroseat and features a classic well designed seat, also used on Cathay Pacific. At least every seat has access to the aisle, and there is a decent AVOD TV Screen, plus an EmPower power outlet. 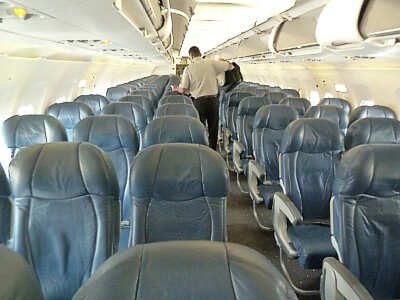 In economy there are 238 seats. US Airways is starting to retrofit them with seatback TV screen. US Airways now has a vast Airbus fleet on its short haul domestic services, and has a big collection of three out of four of the sizes of aircraft. None of them have any form of inflight entertainment of at seat power. NFL Steelers livery US Airways A319 at Minneapolis - St Paul International Airport. This livery celebrates the National Football League's Steelers team from Pittsburgh, which is a major hub for US Airways. The largest version is the A321, of which there are 59, and which has four rows of First class, and 167 down the back. Service can be a bit slow, with only a single isle for service. All seats are in a 3-3 layout in economy, which has a very standard Airbus seat, with little to recommend or veto it. In business there are however much larger seats. 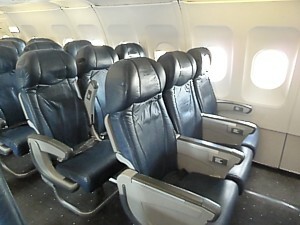 There are 72 of the larger Airbus A320-200, again seating 12 in first class and 138 in economy. The A320s seat 168, in economy with Row 10 and Row 11 being the overwing emergency exit - if you ask to sit here, you will get 2 inches more legroom. US Airways has a huge fleet of 93 of the smaller A319, seating 124, of which 12 are in First Class, with three rows of larger first class seats. The rather squat A319s has only one overwing ejectable windows - sit here, in row 10, and you'll get 2 inches extra legroom. US Airways has a small, rather elderly, fleet of ten Boeing 767-200ER which are used on medium haul routes to the Caribbean. They seat 18 in Business Class, and 186 in economy. They haven't been renovated, and the cabin looks pretty tired. 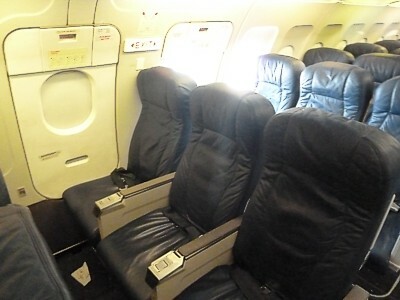 US airways has announced plans to renovate the cabins, and include AVOD screens in all classes. 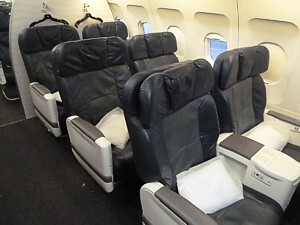 In Business Class The Boeing 767-200ER US Airways use have 18 Envoy 'lie slope' seats in a 2-2-2 layout. Make no mistake, these are no flat beds, and instead the seats recline flat, but at an angle of about 30 degrees to the floor: on a long flight this can make your ankles ache. There is a 110 V AC power outlet at each seat, and there is no seatback TV, however small ipad like devices are handed out, with a small selection of films and TV programmes. Economy is pretty basic, with a 2-4-2 layout. There are still overhead CRT video units, and wall mounted LCD monitors on the bulkheads, which show a moving map. US Airways has a small fleet of 15 of the small Embraer 190s, seating 99 (with 11 in business class). All are very new, but there is no inflight entertainment. The plane's size can seem a little odd however - from a distance these look like a full size jet, and then when you get on board you realise that they are actually quite tiny, with 2+2 seating in economy, and 2+1 seating in First class where there is a remarkable 39 inch pitch, in three rows. US Airways has two different types of 757. With either a basic First Class for domestic, or a much better Business class for the international variants. Some of these are quite old. The B757s are notable from similar looking A321 by the extra wingtiplets on the airbus aircraft. 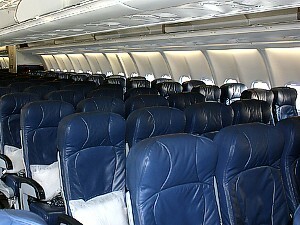 The Boeing 757 US Airways use on domestic runs have 15 'First' class seats, and 176 economy (coach) seats. There are only nine of these left in the fleet, so you have to be pretty lucky - or unlucky - to end up on one of these, rather than their replacement, the A321. Regular passengers tend to call these "guinea pig cages", due to their extremely dense seating, and their regular appearance on routes to islands in the tropics. All overhead monitors in these aircraft have been removed, with the exception of some aircraft used to Hawaii. The Boeing 757 US Airways used internationally on transatlantic routes have 12 'Envoy' Business class seats, and 164 economy (coach) seats. In Business Class there are 12 Envoy seats using the old style cradle seat in a 2-2 configuration, with a recline of approximately 160 degrees and a pitch of just 55 inches. There is a 110 V AC power outlet at each seat, but no seatback TV. However personal entertainment devices are handed around on takeoff. In economy The most sought after seats in the 757-200s are in rows 11 and 30, the emergency exit rows, where there is a whopping 38 inches of legroom. however here the window seat F is missing.